Are you fascinated by the processes that are shaping our contemporary world? The UBC Vantage One Arts program includes courses in history, sociology, geography, political science, psychology, research and writing, to give you a solid foundation of knowledge in the arts and to strengthen your communication skills. 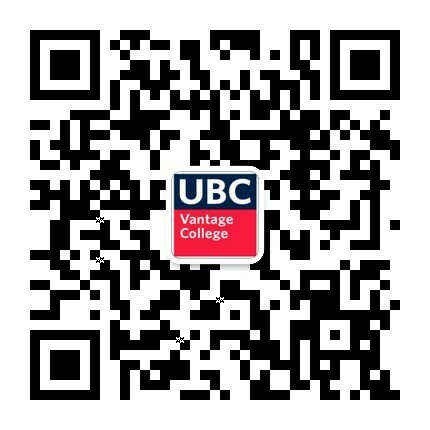 Wondering how you can progress from Vantage One to Year 2 of your UBC degree? Learn more here. First year of UBC’s Bachelor of Arts, graduates of Vantage One Arts are fully prepared to transition into second year of the degree, so the program doesn’t add extra study time. Includes Academic English courses, designed to further develop language skills alongside academic studies. Small class sizes ensure a heightened degree of support from both faculty and fellow classmates. With over 50 highly-trained faculty and staff at Vantage One, students are surrounded by a strong support network to enhance their academic performance, English language development, study skills, and overall preparedness for continuing degree studies at UBC. All Vantage One Arts students complete Term 1, Term 2 and Term 3 (May to July) at UBC's Vancouver campus. Upon successful completion of the Vantage One Arts program, you will progress into second year and finish your Bachelor of Arts at UBC Vancouver. Some majors may require additional application materials and prerequisites in your second or third year, while others can simply be declared. 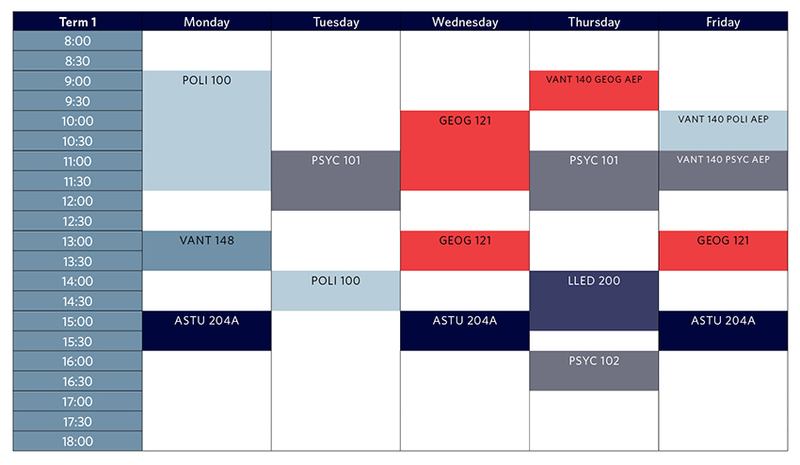 This is not a complete list from the UBC calendar, but it is a starting point to help you begin your research into the different majors. It is up to you to determine that you meet the appropriate requirements for the majors you are interested in. Speak to your academic advisor to help you plan your degree. Most of these programs are third year entry (meaning that you start your major when you are in year 3). For most of these, you will need to take specific courses in year 2. Please consult your academic advisor or visit the calendar page for more information. All Vantage One Arts students must complete ASTU 204A, LLED 200, WRDS 150, VANT 140 and VANT 148 throughout Term 1 and Term 2. In addition to these five mandatory courses, students must choose one of three ‘course cohorts’ detailed below, depending on their areas of interest. Why do we behave the way that we do? How are we influenced by time and place? Students in Cohort A will examine these questions through classes in Psychology, History, Geography, and Arts Studies in Research and Writing. As a student in Cohort A, you will have opportunities to investigate related themes of power, globalization, conflict, conformity, colonialism and imperialism, migration, motivation, and sustainability. How do we understand change and its effects on a broad range of people, places, institutions, and ideas? Students in Cohort B will examine this question through classes in Political Science, History, Geography, and Arts Studies in Research and Writing. As a student in Cohort B, you will have opportunities to investigate related themes of globalization, imperialism, colonialism, migration, political action, and their connection to concepts of power, agency, conflict, peace, and sustainability. To understand contemporary problems, should researchers look inside individuals or beyond them to the social and political contexts they live in? Today’s global world requires citizens and scholars who can define and analyze pressing issues from multiple lenses and levels of analysis. Students in Cohort C will examine these issues through classes in Psychology, Sociology, Political Science, and Arts Studies in Research and Writing. As a student in Cohort C, you will have opportunities to investigate related themes of human behaviour and agency, political relations, socio-political inequality, power, and social constructions of identity and experience. This is an interdisciplinary course that focuses on the critical thinking practices we find in the humanities, in disciplines such as literary studies, art history, film studies, media studies, and history. Humanities scholars study connections between forms of culture and the communities that produce them. They use artwork, texts, and films as important sites of inquiry, and interpret these sites to make complex claims about human societies. In this course, you will practice the ways that humanities scholars analyze different cultural forms, use them as evidence, and make claims about them in their scholarly writing. This course will explore various themes of conflict and change from the 17th century to the end of the Second World War. Issues like the changing nature of violence, technology, colonialism, anti-colonialism, the rise of modern state systems and clashes between East and West will all be explored through this lens. This course will examine the changing nature of violence from the beginnings of the Cold War to the 21st century. Themes and topics will include: decolonization, changing political ideology, civil war, sub-state actors, extremism, terrorism, symmetrical and asymmetrical warfare as well the relationship between civilians and both state and non-state violence. Inequality, institutions, social structure and social change. The course examines the Human geography of the modern world since 1945. Themes include global interdependence in economic geography, geopolitics, and cultural geography; consequences of modernization, including demography, urbanization and environmental effects; regional case studies; and reactions to modernization. This course introduces students to writing in university. It promotes deeper understanding of the role of language in achieving academic and professional registers by providing explicit instruction in language-linked strategies for writing effectively, individualized feedback, and extensive opportunities to write across a variety of university registers. This course offers a general introduction to the study of politics. Topics covered include key concepts such as power, ideology and identity; relevant actors including states, citizens and institutions; systems including democracy and authoritarianism; and various trends in contemporary politics such as globalization and conflict. This course explores a range of topics including the usefulness and potential limitations of comparative analysis, political ideologies, regime type, the role of civil society, nationalism, democratization, economic development, conflict and political culture. While much of this course focuses on the comparison of states and systems within states, it also explores differences and commonalities between other political groupings including resistance movements, regional institutions and non-state armed groups. Introduction to Methods and Statistics, Biopsychology, Learning, Perception, Memory, and Cognition. This course introduces some of the major research areas within the field of psychology: the scientific study of behaviour. The course begins with an overview of the field of psychology and its research methods. It then deals with several fundamental topics in psychology: social behaviour, intelligence, motivation, emotion, development and personality. The course concludes with the topic of psychological disorders. Sustained language support for linked content courses in the Vantage One Program. Students develop strategies for self-directed learning. Projects linked to topics explored in the UBC Vantage College Vantage One Program curricula. Research project that culminates in student-led conference and research presentation. This interdisciplinary academic writing course provides students with opportunities to learn how to participate in the research cultures of the university. In this version of the course, students are introduced to social scientific ways of thinking and writing, and offered opportunities to contribute, as novice researchers, to scholarly conversations about global citizenship.